Compartment that holds a film cartridge. Rotating cylinder that directs the film from the cartridge toward the film guide rails. Each of the flat metal rails on both sides of the focal plane shutter; the taut film travels along them. Indicator showing whether the film leader (end of the film extending outside the cartridge) is properly inserted into the take-up spool. Spring plate that keeps the film flat as it passes behind the lens. Small serrated wheel that guides the film toward the take-up spool. Cylinder for winding the exposed film. 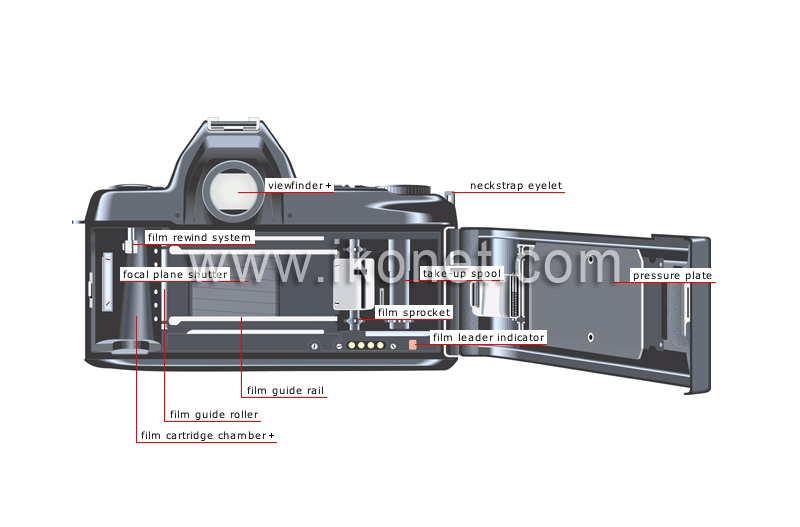 Manual or motorized device that winds a partially or totally exposed film back into its cartridge.